Sausalito Houseboats, Acrylic on canvas, 9"x12"
Red Rose with Everything, 20"x24"
Visit Kathleen Elsey painting studio when your travels bring you near the coastal town of Santa Barbara, California by emailing in advance for an appointment. You will see my bright and bold paintings in their beginning and nearly finished stages as well as framed paintings covering the walls of my studio. I have several exhibitions coming up with details here. 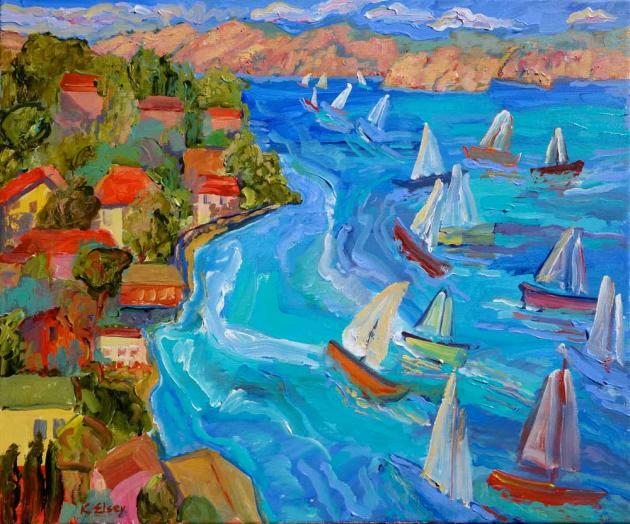 A broad range of Kathleen Elsey fauvist paintings may also be seen at www.elsey.com. I teach plein air and studio painting workshops in New Mexico, California, Ohio and New York. I had several exhibitions in 2014 and am now painting for a 2016 solo exhibition with Thos. Moser in San Francisco. I was interviewed by Daniel Kepl of Bravo California. To watch this discussion about my paintings visit "Bravo! California." Kathleen Elsey was born and raised in Ohio and migrated to San Francisco in 1973. She enjoyed a career in art direction and design management with Hewlett Packard for 10 years. After a two year sabatical in Portugal as an aerobics instructor, Elsey settled once again in San Francisco. In 1985, she formed Kathleen Elsey Design, Inc. and designed logos, brochures and web sites for companies including Tivo, Xerox, and Silicon Graphics. In 1998 she closed the doors of her design studio to devote her energy to the fine arts. Since then has Elsey paintings have been exhibited in galleries and museums across the country. She is a juror and a painting workshop instructor. Currently, she teaches Kathleen Elsey Painting Workshops for acrylic and oil painters in Sonoma, Santa Barbara and Taos, New Mexico. You will find more information about Kathleen Elsey painting workshops at www.elsey.com. I am a contemporary American painter focusing on interiorscape, landscape, sea scape and still life. My paintings are marked with rich colors and dramatic brush strokes recalling Expressive and Fauvist traditions. My new paintings on canvas include beach scenes and paintings of interiors with interesting assemblages of shapes and colors. In my search for shapes, colors and light, my work tends to become more abstract. More information about Kathleen Elsey biography is available on my website. For a visual journey of the past twenty years of my life, my historical paintings tell the story. 1988-present Post-graduate drawing & painting, Foothill College, College of Marin. Private studies with Michael Loffredo, Santa Rosa, Ca., Rick Stich, Santa Barbara, Ca. 2011-2012 Solo painting exhibition Chalk Hill Winery, Healdsburg, Ca. 2012 Santa Barbara Museum of Art "Off the Wall"
2005 “Master Piece Award” Int’l Society Acrylic Painter’s Exhibition, Seattle, Wa. 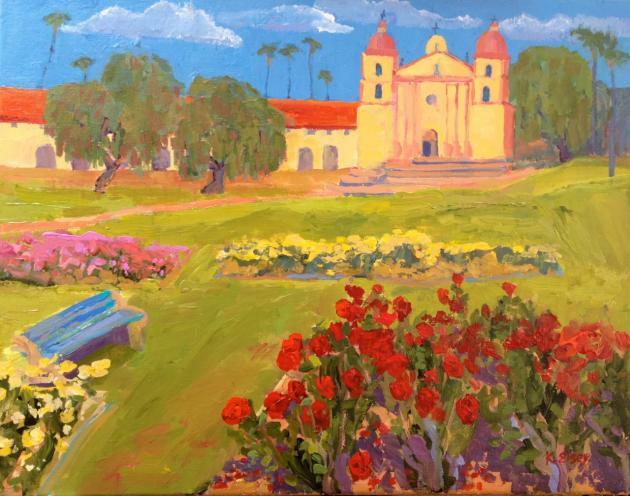 Learn more about New Fauve Kathleen Elsey and her painting workshops here.